We now know that harmonious, respectful relationships are not only better for the working teams but can result in improved advertising quality that has P&L value for both organisations. Based on an analysis Effie Award winners, we found that better relationships deliver better work. We sifted through all the 2018 Effies winners and discovered 69 instances where the client-agency involved had been recently evaluated by Aprais. In other words, where the winning campaign could be directly linked to a relationship under evaluation. What we were endeavouring to discover was the state of the client-agency relationship at the time the work was being developed as opposed to the scores at the time of winning the award. The case is proven. There is a correlation between the health of the relationship (as measured by Aprais) and advertising effectiveness. Used by many of the worlds’ leading marketers, Aprais is the most powerful system to measure, monitor and improve business relationships. 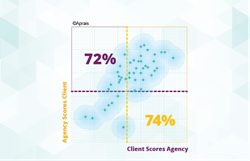 A robust database covering more than 19,000 client-agency relationships across 92 countries, reveals value-added insights from the very first evaluation. The Aprais ‘built-for-purpose’ online system has been proven and refined over 20 years. The system uses a user-friendly interface driving a 100-point scoring mechanism that ensures greater result sensitivity and actionable results. State of the art diagnostics tools allow real-time data interrogation.